Has Psy’s ‘Gangnam Style’ Helped Double Daddy’s Stock? Korean pop star Psy, whose music video for "Gangnam Style" has recently replaced "Call Me Maybe" as the viral sensation du jour, may be influencing more than just song sales and YouTube views. Since the July debut of the frenetic and funny video, which mocks the opulent culture of the Gangnam neighborhood in Seoul, his father's South Korean semiconductor company has seen its stock price more than double. Mere coincidence? Some people don't think so. In early August, soon after the video debuted, D I Corp's stock (003160.KS) hit 1,500 won ($1.34). Now, almost two months later, the stock has climbed to 3,645 won ($3.26). The company's market capitalization is now 1.135 billion won, equivalent to about $100 million. 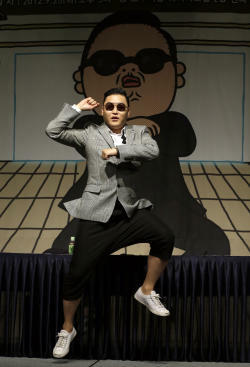 Psy, whose real name is Park Jae Sang, is the first Korean pop star to top Apple's (AAPL) music download charts. The YouTube video has had more than 270 million views so far; a recent appearance on Saturday Night Live seemed to cement Psy's role as a cultural phenomenon. And some investors are banking on this phenomenon having a positive influence on his father's company. Psy's father, Park Won Ho, is chairman and CEO of D I Corp and holds a 10% stake, according to a news report by Korea's MK Business News. Psy's uncle, Park Won Deok, is vice chairman of the company's board and owns 15.8% of the shares. South Korea's market regulations actually prohibit a company's stock from rising or dropping more than 15% in a day. Yet D I Corp. has hit the limit-up consecutively in the past three days. Korean Regulators disagree with the notion of Psy affecting D I's stock. There are rumors that some people may have colluded to drive up the stock price in order to gain a profit. The Korean Financial Investment Association has indicated there is no link between the D I and Psy and that an official warning for investors may soon be released, according to news reports. The company has also not reported any major new developments or product releases in the past couple of months that would warrant the doubling of the stock price. So the Association sees the surge as being unusual and is advising investors to be cautious because shares could drop as quickly as they rose. Portfolio Manager of Victory Capital Management Eun S. Cho says he can't pinpoint a specific cause for the stock's gain. "This is an atypical situation," he says. "It perhaps could have been influenced by Psy's popularity." But he noted that, "regarding the company, they were loss-making, so most institutional investors see that as a red flag. It's not a stock that's been covered and followed regularly." Regardless of whether Psy has had a direct influence or not, some investors are riding the wave and betting on both D I Corp and YG Entertainment, the company that represents the singer. YG's (122870.KQ) stock price has nearly doubled as well in the past couple months; this is a much more reasonable correlation, as Psy actually works with the company. For example, Psy is expected to generate sales of at least 11 billion won or almost $10 million, according to Korean entertainment site ENewsWorld. The singer also recently signed with music executive Scooter Braun, who represents Justin Beiber, and he is expected to release a new album in November. This correlation of rising star and related company recently occurred in the U.S., as Knicks player Jeremy Lin became -- briefly -- basketball's darling. As Linsanity was born, Madison Square Garden's (MSG) stock saw a lift. But as his fame declined, so did MSG. Adding another layer to this stock story are news reports in South Korea that Park Won Ho's friendship with presidential candidate Chung Woon Chan may have also helped D I shares. Family activity as a factor in a business's stock movement is more common with large corporations in Korea that have historically been family-owned and where a familial line of succession is clear. In that case, a company may be affected either positively or negatively by the actions of a child or other family member. But the case with Psy and D I Corp is not the same. Cho says the impact of a family member would depend on the shareholding structure and is something that can be seen in cultures similar to Korea, such as Japan or Indonesia.